Please don't get my ebooks from a pirate. Not only do you risk spyware, ransomware, and other viruses to your computer, you also make it harder for me to keep writing books. If you want my ebooks for free, however, you can ask your local library if they offer them through this great service called Overdrive. Click the button for more details. In this prequel to USA Today bestselling author Jamie K. Schmidt's The Emerging Queen's series, Bianca is a human with a problem. She just landed her dream job of working as a dragon-human liaison at the Smythe Corporation, but for some reason dragon studs keep following her around. When Niall, the All Knowing, a golden Celtic dragon sends her to get a rare book written by the Order of the Dragon Slayers, Bianca is stunned by her attraction to the esoteric book store owner. Byron is a dragon who is still mourning his long lost Queen. 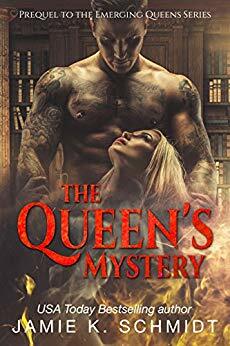 The fact that Bianca's scent reminds him of his only love is enough to intrigue him, but when the Order of the Dragon Slayers take her away from him, it brings out the protector in him and he'll stop at nothing to get her back.